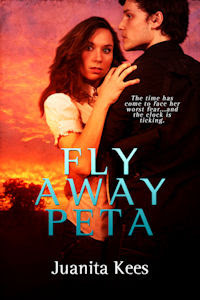 ROMANCE BOOK PARADISE: Juanita Kees, Fly Away Peta and Giveaway! Juanita Kees, Fly Away Peta and Giveaway! We have Australian author Juanita Kees answering questions and she's also got a giveaway! A reluctant cleaning fairy who would much rather be writing romance, a disastrous cook who can burn water and a gardener successful in growing everything except plants and flowers. I love making up stories and the only way I can do that legally is to write. It’s the place I escape to when the real world gets too much. It chose me, I think. My characters have a way of choosing where they want to go and I let them. I’d never try to fit a square peg in a round hole. Jaime and Peta have been determined to tell their story for almost thirty years now. They are one of those couples who were destined to be together, no matter what life threw at them. Both are strong, independent characters fiercely protective of the ones they love. I wrote this story for those who believe in second chances, no matter what the challenges. Love is about forgiveness, trust and commitment. Follow your heart and fulfill your dreams. Most importantly, fight for what you believe in and never give up. Why did I write the book? Easy! Jaime and Peta nagged me to and wouldn’t let me rest until I had, LOL. No matter how many times I edited this story, the title stuck. It seemed the perfect fit for a girl running from her heart while protecting those she loves the most. Tell us about FLY AWAY PETA. Peta Johnson will go to extreme lengths to protect her daughter Bella. When Bella is kidnapped, the search for her takes Peta back to the small Western Australian country town of Williams, a place she’d vowed never to return to. The town where her dreams were shattered and her nightmare began. Back to the place she’d been destined to meet two very powerful, yet very different men. One would break her heart, the other would destroy her soul. Both would change her life forever. The search for Bella brings them together. Secrets and lies keep them apart. Can Peta and Jaime renew their love in the face of danger or will he let her fly away again? I feel the same way--stories find me. Each of my manuscripts has a magical twist--I can't help it. Your book looks like a good mix of romance and mystery. Welcome to Romance Book Paradise, Juanita! I do hope you will enjoy your visit here! So true! Thanks for coming by! I love the reluctant cleaning fairy idea! I feel the same way about cleaning. Nice to meet Juanita. The book sounds interesting! If you enjoyed Jaime and Peta's story, you're going to love TJ and Scott in Under the Hood, due for release from Harlequin Escape in March. It's fun and feisty and I had so much fun writing it. Thanks for popping in to say hi! I can relate to the characters and genre choosing me. I think the stories come out best when that happens. I know all about being nagged by a story. Sounds great! I'm so glad they got their happy ending. When I wrote those last few sentences, it was like saying goodbye to my children. Thanks for popping in, Jennifer! I love your description of yourself. Great to meet you, Juanita. Lovely to meet you too, Shelley! I love your philosophy Juanita, it really resonated with me. There's a reluctant cleaning fairy here too. Lovely to meet you here & all the best with your blog tour. Great to meet you, Juanita. Good luck with your book. I'm a very reluctant cleaning fairy too - I keep looking for more enthusiastic ones but no luck yet! Great interview! I like that - "A reluctant cleaning fairy." I'm one of those, too! Thanks for popping in to say hi. I'm off to explore your website now. I was a little lost without them at first until I found TJ and Scott from Under the Hood to play with. I love the titles that stick with you. It can give a lot of direction to a story when you have just the right title. Thanks. I've had a lot of fun with Nas. So true! And a great title is a great hook for readers too. Thirty years is a long time for a story to percolate, I'm sure it was a lot of fun to write after all that time in your head! Yes it was. I was really happy for them when they finally got to The End and I could wave them off to a happy ever after. The book sounds good, Juanita! Congratulations! My proudest moment was that my dad read it and enjoyed it. Apparently my uncle missed a whole cricket match because he couldn't put it down. Now that's high praise indeed!